Make simple lawn care choices to manage your yard that are more healthy for you, your community and the environment. The use of native plants is key to any environmentally friendly landscape. The deep roots of native plants reach far down into the ground, firmly rooting soil and reducing erosion, and also absorbing rain where it falls to carry it back down to our groundwater supply, filtering it as it goes. Consider replacing a patch of high-maintenance lawn with lower-maintenance native perennial plants. Plants native to northern Illinois thrive in our weather conditions, requiring less water once established, and generally do not need fertilizers or pesticides. Native plants also provide habitat and food for birds and butterflies. Non-native species compete with and often choke out more beneficial and well adapted native species. Unleash any workplace stress on the nearest garlic mustard, buckthorn or honeysuckle! Why spend money and drinkable water on irrigation efforts when what you need literally falls from the sky? Rain barrels and larger scale rainwater harvesting can capture the rainwater that falls on your property so you can put it to use and keep it from running off, collecting pollutants as it goes and carrying them into our rivers and streams. The runoff of chemicals from fertilizers, herbicides and pesticides is a major pollutant in our rivers and streams. Work to reduce or eliminate the use of fertilizers, weed treatments, salt and other chemicals, which are harmful to birds, butterflies and other two and four-legged visitors, and also to fish and aquatic life when they reach our waterways. When mowing the lawn, use the mulching feature rather than bagging the clippings. Returning grass clippings to the yard keeps your lawn healthy and saves space in the landfill. In fact, the clippings contain valuable nutrients that can generate up to 25% of your lawn's total fertilizer needs. Grass clippings do not contribute to thatch since they are 75 - 85% water and decompose readily. Grass clippings also make great mulch in your vegetable garden. Build healthy soil by recycling organic material for plant growth. Leaves, grass clippings, weeds, prunings, dead flowers and ash from burnt wood can be composted...not only to reduce yard waste, but to nourish your landscaping. Composted materials provide important nutrients for soil and plants. For more information on composting visit the University Of Illinois Extension Service “Composting for the Homeowner” website. Avoid Coal Tar-Based Asphalt Sealants! Coal tar, a byproduct of coal processing, contains high levels of a toxic chemical called polycyclic aromatic hydrobarbons (PAHs). When an asphalt driveway is sealed with these products, the PAHs wear off and the asphalt breaks down into particles that wash off into the streams and rivers when it rains. Use a safer petroleum-asphalt based sealcoat to protect yourself and the environment. Yard waste must be properly prepared and placed for collection. Leaf collection services vary by community; check with your community for leaf collection options. Dumping yard waste into storm drains or waterways adds excess nutrients to the water, can clog the drains and contribute to roadway flooding; and it is illegal. Animal waste contributes to surface and groundwater bacteria, so it is important to remove pet waste from your yard and pick up after him at the park, or wherever he goes when you're out walking. Place it in the trash, bagged, or flush smaller quantities down the toilet. We’ve all seen leaves piled in the road gutters, and clogging storm drains when it rains and washes the leaves away. The leaves are washed into lakes, rivers and streams. 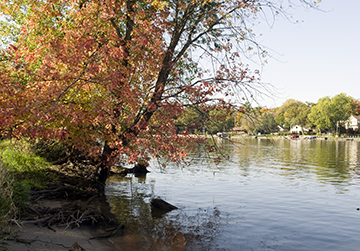 Eventually the leaves reach area waterways, and as they break down in the water, they release high levels of phosphorus that cause algae to grow. Algae is harmful to health of ponds and rivers. Place your leaves in your compost pile or bag them for pick-up. Snow and ice are also frequently to blame for storm sewer backups, so grab the shovel and keep storm drain openings clear. 1" per week is enough rain/water to keep most lawns healthy. Watering too much or too little is the cause of many common plant problems. You can have healthier plants and save money by giving your lawn/garden only what is needed.